I was invited by Creativity Works in Lancashire to produce a new work based on the Howarth Art Gallery’s Tiffany glass collection which is the largest outside the USA. Tiffany glassware is commonly associated with lighting pieces, in particularly table lamps and ceiling lights with intricate decorative dome shaped shades. Using this as a starting point I decided to create a piece of work which incorporated lighting in order to accentuate and celebrate the translucent quality of glass. Nature and the 3 elements Water, Air and Fire had strong influences on Tiffany designs and so I wanted to reference this aspect in my work. 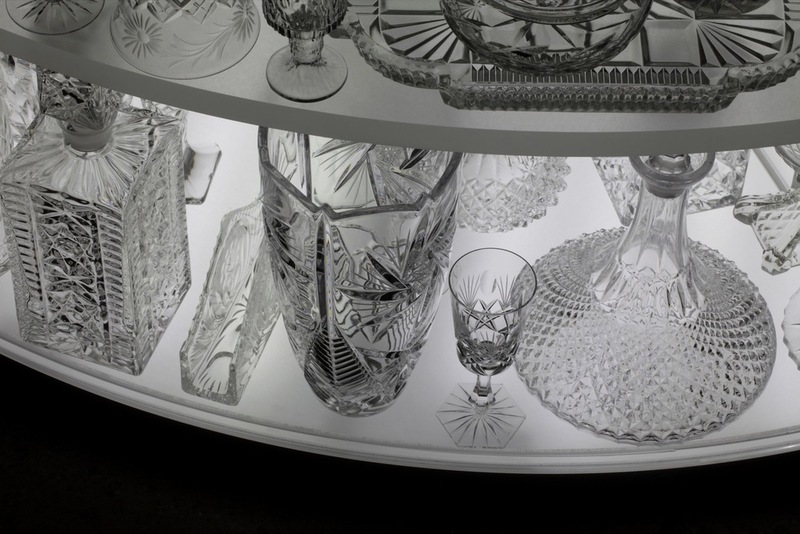 I was drawn to the ubiquitous pressed crystal glassware which is displayed in many UK households. This glass is heavily textured with angles and cuts which are reminiscent of ice crystals. Tiffany glass utilizes many different manufacturing processes which create a variety of sophisticated and decorative finishes such as Ring Mottle Glass and Herringbone Ripple Glass. The results are extremely colourful and ornate. I therefore decided to go in the opposite direction and eradicate colour from my work and purely focus on the distinctive textural aesthetic and forms of pressed crystal glassware. The result is a domed shaped igloo built from layers of clear crystal domestic glassware, softly illuminated from the base.